An apparancy is something that seems to be, that appears to be a certain way; something that appears to be but is different from the way it looks. 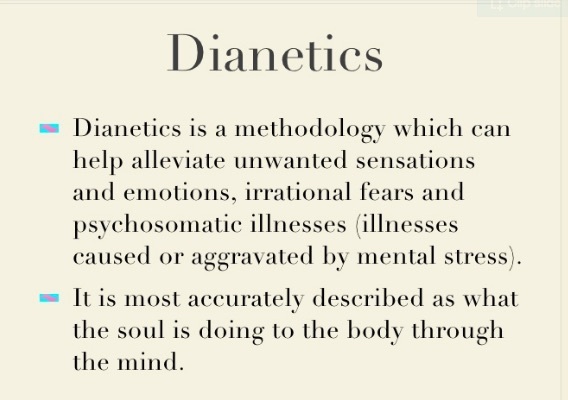 In Dianetics and Scientology apparency is used to mean something that looks one way but is, in actual fact, something else. For example, a person “gives an apparency of health,” whereas he is actually sick. From the Latin, apparere, to appear. Communication: the interchange of ideas across space. Control: positive postulating, which is intention, and the execution thereof. Axiom 57 - what is Order? Order manifests when communication, control and havingness are available to theta. We alter reality in order to accommodate a lie. This is what causes problems. Theta brings order to chaos. Havingness: that which permits the experience of mass and pressure. An “unsolvable problem” would have the greatest persistence. An "unsolvable problem" would also contain the greatest number of altered facts. To make a problem, one must introduce alter-isness. What lies inside a problem? Any problem, to be a problem, must contain a lie. If it were truth, it would unmock. Life is a game wherein theta as the static solves the problems of theta as mest. That into which alter-isness is introduced becomes a problem. the physical universe—MEST—tends to encumber the thetan and cause it to act contrary to its true spiritual nature. ALTER-ISNESS is the consideration which introduces change, and therefore time and persistence, into an AS-ISNESS to obtain persistency. If you have a Problem, there is a reason for it: something has changed from some kind of fundamental Isness that didn't have that Problem. Every Problem has a root Cause, which is that something was Altered at some point in the past. unmock: become nothing, disappear, cease to exist. Theta can become a problem by its considerations, but then becomes mest. Mest is that form of theta which is a problem. Theta as mest must contain considerations which are lies. Chaos brings disorder to theta. AS-ISNESS is the condition of immediate creation without persistence. AS-Isness is the condition of existence which exists at the moment of creation and the moment of destruction, and is different from other considerations in that it does not contain survival. ISNESS is an apparency of existence brought about by the continuous alteration of an AS-ISNESS. This is called, when agreed upon, reality. Theta can consider itself to be placed, at which moment it becomes placed, and to that degree a problem. All Problems are just a matter of "reality" which is simply something that is agreed upon. Time is the primary source of untruth. Time states the untruth of consecutive considerations. Reality is that which appears to be. Reality is fundamentally agreement — what we agree to be real is real. To solve any problem it is only necessary to become theta, the solver, rather than theta, the problem. is caused by the thetan’s own experiences, whether in current or prior lives. As these experiences accumulate over time, they cause the thetan to become enmeshed with the material universe. It is through Scientology’s central religious practices, that the thetan is able to extricate himself from this entrapment. This is analogous to the concept of salvation found in other religions. Chaos and disorder in one's thinking is manifested in MISCOMMUNICATION or LACK OF COMMUNICATION, in LACK OF CONTROL, in NEGATIVE POSTULATING, in the HOARDING or IGNORING of IDEAS, and ultimately in LACK OF POSSESSIONS and inexperience with heavy thinking and pressure thinking. You think about one thing. Then you think about another thing. So it's thinking about one thing after another. The lie is that you can think about your problems and solve them over time. This is a lie, time does not solve your problems, you need power. Creation is accomplished by the postulation of an as-isness. To create something, you really have to postulate something that already is sort of there, immanent, invisible to others. The ideas in LRH philosophy, he implies, were "always there", waiting for him to stumble upon. That is why others recognize greatness of true creation, because it's something that everyone actually senses is already there already. Postulates and live communication not being mest and being senior to mest can accomplish change in mest without bringing about a persistence of mest. Thus auditing can occur. The term comes from the Greek letter theta (Theta), which the Greeks used to represent thought. Theta has the ability to influence and change its environment and achieve total knowingness through total questioning. Timelessness is the solution because there are principles that solve almost any problem. Also, all problems are temporary, as long as Theta is paying attention to solving it. Theta, the static, has no location in matter, energy, space or time, but is capable of consideration. The ability to evaluate importances and unimportances is the highest faculty of logic. Scientology is about the MIND, which is BEYOND IT ALL. The MIND doesn't exist in the universe. It is the only thing that can THINK. The Mind has no location in matter. It isn't the brain. The Mind has no location in energy. It isn't a force. The Mind is Now, but it can also be moved to Consider things in the Past or the Future, right? It isn't located Now, it's located wherever it's thinking. Your Mind can flit anywhere in the Universe, even into imaginary universes. Your Theta is totally free to explore if you just would Learn How.